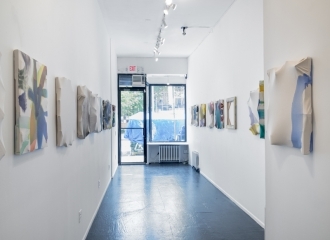 Arts+Leisure is the project space of Lower East Side-based gallery Freight+Volume. Established by Nick Lawrence (co-founder and former partner of LFL Gallery in New York and owner of DNA Gallery in Provincetown, MA) in 2005, Freight+Volume was formed by combining the text-based, narrative philosophy and limited edition book focus of its two-year predecessor, Volume, with the motivation to show dynamic, visceral, and provocative new work in all media and dealing with a range of subject matter. F+V is dedicated to showcasing the work of emerging and established artists, and in particular work which is innovative and not afraid to take risks. While F+V is especially interested in narrative and text-based material, ultimately our predominant criteria is the quality of the work itself, regardless of technique, content or style. In keeping with the tradition of publishing with which the gallery was founded, F+V magazine was launched as an outlet to learn about the artists with whom the gallery works, as well as their friends and influences. The magazine is a medium through which to explore not only the work of the artists, but the creative process and the cult of personality. In addition, Freight + Volume regularly publishes limited-edition artists' books. Freight + Volume is pleased to present its seventh season of the DNA artist-in-residence program for Summer 2018. Over forty artists were invited for residencies on the Cape this season, to create new work inspired by their environment or continued from their existing studio practice, either created at DNA or offsite. Past participants include: Peter Allen Hoffmann, Kristen Schiele, Black Lake (Susan Jennings + Slink Moss), Daniel Heidkamp, Erik den Breejen, David Baskin, Elizabeth Huey, Aaron Johnson, Rosa Almeida, Russell Tyler, Maria Calandra, Trudy Benson, Nicole Wittenberg, Jessica Wynne, Mi Ju, Ilse Murdock, James Franklin, Danica Phelps, Lance Rautzhan, Rebecca Goyette, Cesare de Credico, Shiva Burgos, Genevieve White, Dirk Skreber, George Jenne, Max Razdow, Laurina Paperina, Chris Bors, JJ Manford, Elisa Soliven, Marysia Schultz, Romer + Romer, Joshua Abelow, Leah Dixon, BROLAB (Ryan Roa, Adam Brent), Travis LeRoy Southworth, Gina Magid, Rachel Fick, Cristina de Miguel, Maggie Ogden, Samuel Jablon, Tina Hejtmanek, Meg Lipke, Wendy White, and Patrick Keesey. The residency is by invitation only. For more information, please visitwwwDNAgallery.com.